FIRST SOLO: Pictured is my flight student, Kalab Hughart, who accomplished his first solo flights March 19, 2019, at Greenbrier Valley Airport, Lewisburg WV. I didn't tell him until after the flights that it was also the 42nd anniversary of my first solo flight - at this same airport. I also taught Kalab's uncle, Keith Holliday, to fly in 1986, and his father-in-law, Mike Teubert, in the early 1990s. HAPPY FLYING, Kalab! Learn to Fly Day: DATE CONFIRMED! At Hinton-Alderson Airport (WV77), Pence Springs, West Virginia, Saturday, May 25, 2019. Picnic dinner at 12:30 pm. All pilots, instructors, and aviation enthusiasts are welcome to attend and participate. Sponsored by Eagles' Wings Flight Training, Y'all Come! Family - Freedom - Food - Fun - Fellowship, and Flying! 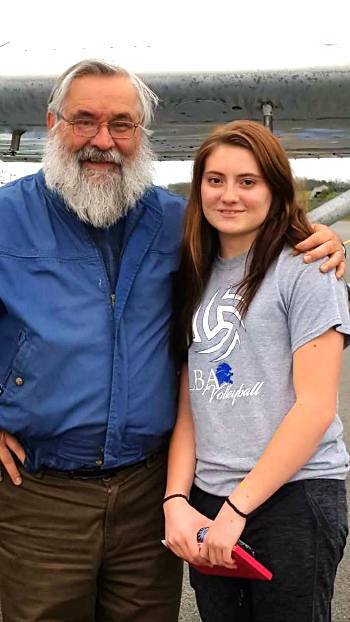 FIRST SOLO: EMMA GRANT, age 16, of Lewisburg, soloed April 26, 2018, at Greenbrier Valley Airport. She is the daughter of Autumn Waid, and granddaughter of Tom and Debbie Long. Emma is a student at Lewisburg Baptist Academy. Congratulations, Emma! FIRST SOLO: MALACHI KRATZ is shown with his instructor David Hersman after his first solo flights October 26, 2017, at Greenbrier Valley Airport, Lewisburg, West Virginia. Malachi's family has recently moved to Georgia, and he is continuing his flight training there. NEW PRIVATE PILOT: George MacKinnon is shown with Flight Examiner Don Judy after his Private Pilot Practical Test October 14, 2017, at Elkins, West Virginia. The airplane is a Diamond DA-20-C. Sadly, George passed away the following August, but I am honored to have had the privilege to help him see this dream come true. FIRST SOLO: Damani Mitchell is all smiles after his first solo flights on September 30. Damani is employed by UTC (United Technology) at Union, West Virginia. Congratulations, Damani! FIRST SOLO: Rudy Swatzyna, Soloed Cessna 172, August 22, 2017, at Greenbrier Valley Airport. He is retired from the US Army, and lives in Monroe County, West Virginia. FIRST SOLO: PIctured below is Danielle Price after her first solo flights May 15, 2017. Danielle soloed at Greenbrier Valley Airport. She is an engineer employed by B/E Aerospace at Fenwick, near Richwood. Annual Learn to Fly Day at Pence Springs (WV77) Airport, is always the third Saturday of May. Here I am pictured this year with six of my previous and present flight students: Harry Humphries, Adam Haymond, Andrew Dowdy, Ben Hersman, myself, and the second and third ones I soloed, back in 1985, Bob Jagodzinski and John Dowdy. Free HOT DOGS and drinks at Pence Springs, every third Saturday, beginning April thru October, 2017, weather permitting. Third Class Medical Reform for pilots, called BasicMed by the FAA, went into affect May 1, 2017, and in the next eight months about 25,000 pilots have gone through this simplified process. See more details below. 2018 could be the year your dreams actually get off the ground. :) There is a lot of free "Learn to fly" info on this site. Call, text, or email for more information. YOU can start flying almost immediately. Instruction by appointment. 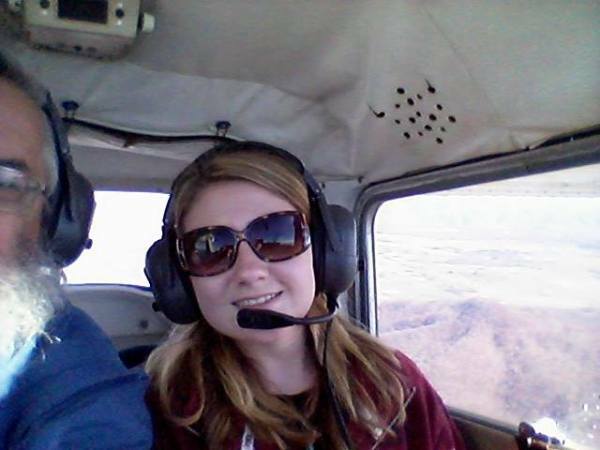 Several young people have recently began flying through Eagles' Wings Flight Training. This is Emma Grant of Lewisburg, WV who began in November 2016. She is a student at Lewisburg Baptist Academy. Pictured below is Andrew Dowdy, 17, of Maxwelton, who received his Private Pilot's License September 24, 2016. He is shown here at Elkins, West Virginia with Don Judy, the Flight Examinar. After completing all the prerequisites for a license, the trainee takes a Practical Test with a Designated Pilot Examiner. The test is partly oral and partly actual flying. Upon successful completion of this test, he is a Licensed Pilot. FIRST SOLO: Patrick Pastrana has a big smile on his face after his first solo flight August 4, 2016, at Greenbrier Valley Airport. Patrick is 19 years old, and an excellent student. He was doing an internship at United Technologies Corporation near Union. He has finished that, and is now back in North Carolina. BIG NEWS: (Updated May 6, 2017) "BasicMed" which is Third Class Medical reform for Pilots has now gone into affect as of May 1, 2017. Most licensed pilots will not have to keep travelling great distances, and fighting their way through the bureaucracy to maintain their flying privileges. New pilots will have to obtain a Third Class Medical Certificate at least once, but will not have to return to an Aviation Medical Examiner every two (or five) years. Instead, he, or she, will get a general checkup every four years from his "family doctor" and take an online course pertaining to aero-medical safety every two years. Most pilots who have held a medical certificate any time since July 15, 2006, will not be required to get another one. The newer regulations will apply to them. Certain medical conditions will still be disqualifying of course. These changes DO NOT apply to Commercial Pilot operations (flying for hire), but will probably be a big boost to General Aviation, which translates to a boost to local economies. 6,000 HOURS! I am pictured with my flight student Patrick Pastrana after his lesson completed my 6,000th hour of flight time, June 20, 2016. 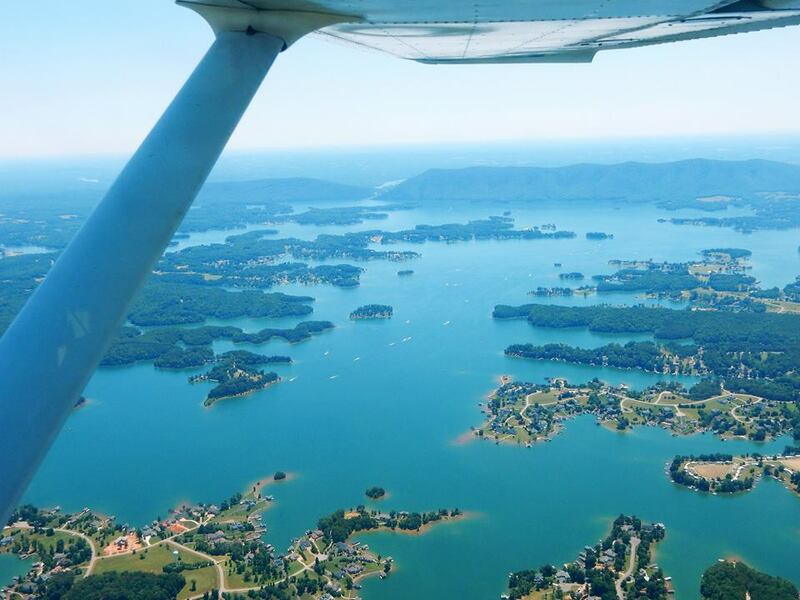 The other picture is over Smith Mountain Lake in Virginia earlier in the day. Let's go FLYING! More pictures on Facebook: David H. Hersman. This page seems to format better on Chrome than on Microsoft Edge. One of my flight students, Harry Humphreys, and I participated in the Annual Prayer Flights over our state Capitols. Because of the weather we couldn't do it on the International Day of Prayer, but a couple weeks later. The goal is to call attention to America's Christian Heritage, and seek God's mercy, guidance, and restoration to this great Land. This is the State Capitol of West Virginia at Charleston. Also included is a picture of Harry and I at the Yeager Airport (CRW) Charleston. IACRA: INTEGRATED AIRMEN CERTIFICATION AND RATING APPLICATION is your online connection with the FAA, the Federal Aviation Administration. For several years applicants for practical tests have been using this path to submit applications online. Now even STUDENT PILOTS must make application through the FAA IACRA website for their STUDENT PILOT CERTIFICATE. Certain information, verification of age, citizenship, etc. have to be submitted by your flight instructor or flight examiner. Then the FAA will send you your certificate by postal mail. Click here to go to the IACRA website where you will first register, and submit your application. Both you and some other verifying offical (probably your instructor) will have to submit electronic signature. It is not a hard or confusing process. You must have your Student Pilot Certificate as well as a Third Class Medical Certificate BEFORE you solo. In April 2016 I celebrated the 40th anniversary of my first flight in a small airplane. I flew this 1946 Piper Cub with a retired flight instructor, Tate Mauzy. Click on the HISTORY button above for more information on the History of Eagles' Wings. ATTENTION, NEW STUDENT PILOTS: On April 1, 2016, new regulations went into effect regarding student pilot certificates. You no londer get your STUDENT PILOT CERTIFICATE from your Aviation Medical Examiner (AME). Before you solo, you still must have a Third Class Medical Certificate, but the Student Pilot Certificate is now obtained through an online application at www.faa.gov/pilots/become/student_cert/ You must have BOTH before you solo! It would be good NOW to be taking steps toward getting your Student Pilot Certificate. Unless you know or suspect a medical deficiency, you may wait until closer to your projected solo date before going to an AME for your Third Class Medical Certificate. If you get it months early, you will not get as much service from it before it expires. Eagles' Wings Flight Training is an affiliate of Eagles' Wings Ministries, the aviation oriented educational ministry of David and Crystal Hersman, based at Clintonville, West Virginia, USA, and associated with Eagles' Wings Christian Academy in Papua New Guinea, and Liberty Christian School in Lewisburg, West Virginia. Our daughter and her husband are currently opening a new affiliate school, Mercy Wings Christian Academy in Goroka. We have many other associates in Papua New Guinea. Flight Instruction is available by appointment at Greenbrier Valley Airport (LWB) Lewisburg, West Virginia, and Hinton-Alderson Airport (WV77) at Pence Springs. They that wait upon the LORD shall renew their strength; they shall mount up with wings as eagles; they shall run, and not be weary; they shall walk, and not faint. (Isaiah 40:31). Get HIGHER EDUCATION - Learn to Fly! A Private Pilot's License looks good on any resume. Welcome to the wonderful world of flying! My name is David Hersman. 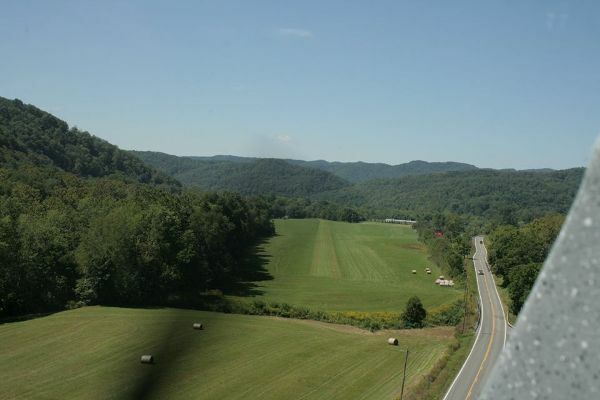 I learned to fly right here in the Greenbrier Valley of West Virginia, soloed in 1977 at Greenbrier Valley Airport. Since 1984, I have given over 5200 hours of instruction. I have had the privilege of training young people who soloed on their 16th birthday, as well as older folks who just wanted to fulfill a life-long dream. I hope I will soon be sharing the sky with you! This web site is designed to help provide you with a lot of free information about flying, inform you about how FUN it is, and inspire you to get started. Copyright © 1997-2019 by Eagles' Wings Ministries. All Rights Reserved.